Very simple, yet very effective. Serve sprinkled with some crushed pistachio nuts for some added texture. Soak the gelatine sheets in some water to soften. Place the egg yolks and sugar in a bowl and add the juice and grated zest of the lemon. Place the bowl over a pan of hot water on a medium heat, and whisk until the mixture thickens and lightens in colour. Add the gelatine to the lemon and egg mixture and remove from the heat. Meanwhile, in a spotlessly clean bowl whisk the egg whites until stiffly beaten. 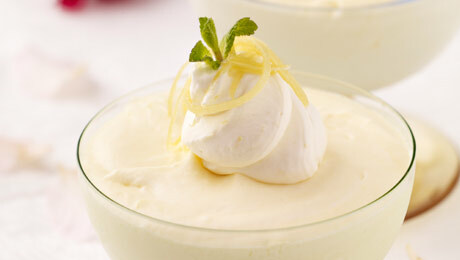 In a separate bowl whisk the cream lightly, (remove 2 – 3 tbsp for serving), then fold the cream gently into the lemon and egg custard. Stir gently then add the egg whites, combining by folding in gently so as not to release the air. Pour into the glasses so that the mixture is level with the top, the place in the fridge to chill and set. When ready to serve place the glass on a serving plate, pipe a little cream onto the top of the soufflé and add your garnish of lemon zest.